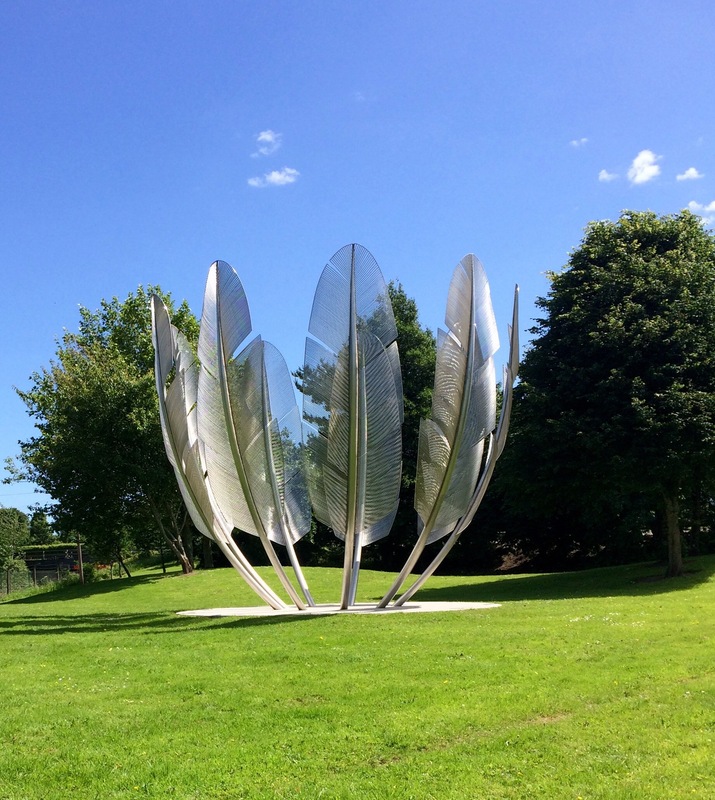 Those of us who live around Midleton, a small town in the east of County Cork, Ireland, are very proud of an impressive art installation that marks a very poignant moment in Irish history. 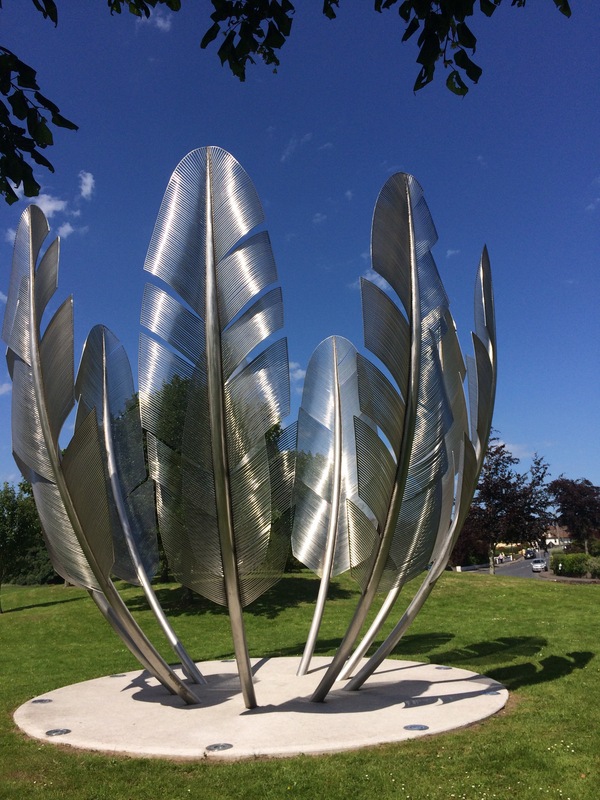 This sculpture honours an extraordinary gift from the Choctaw Native Americans to the starving Irish during the Great Famine that raged through Ireland in the 19th Century. 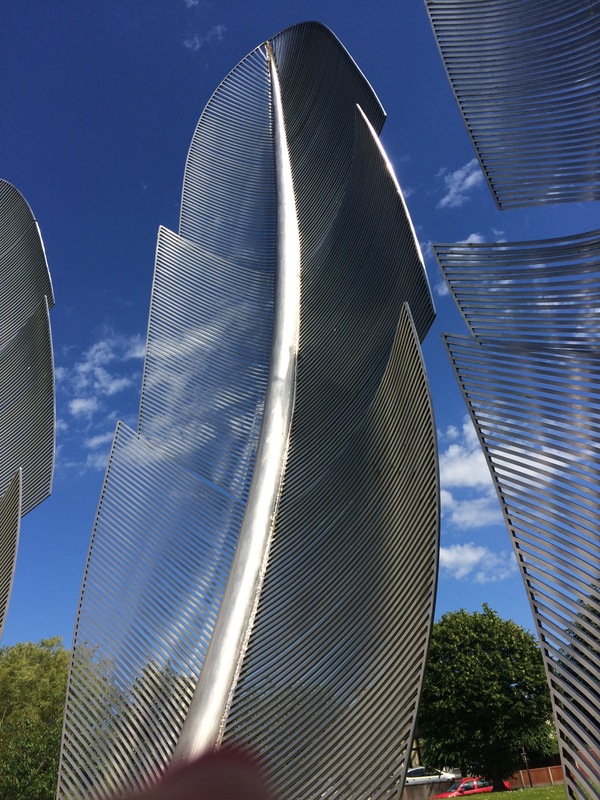 It was created by Alex Pentek at the Sculpture Factory in Cork, Ireland and installed in Bailick Park, Midleton in 2015. Native Americans of the Choctaw, Chickasaw, Seminole, Creek and Cherokee tribes lived in traditional tribal lands in parts of Georgia, Alabama, North Carolina, Florida and Tennessee. However, this valuable land was coveted by white settlers who wished to grow cotton. Andrew Jackson signed the Indian Removal Act that authorized forcible eviction from their native land. In the winter of 1831 under threat of invasion by the U.S.Army, 17,000 Choctaw were first to be expelled from their homelands. 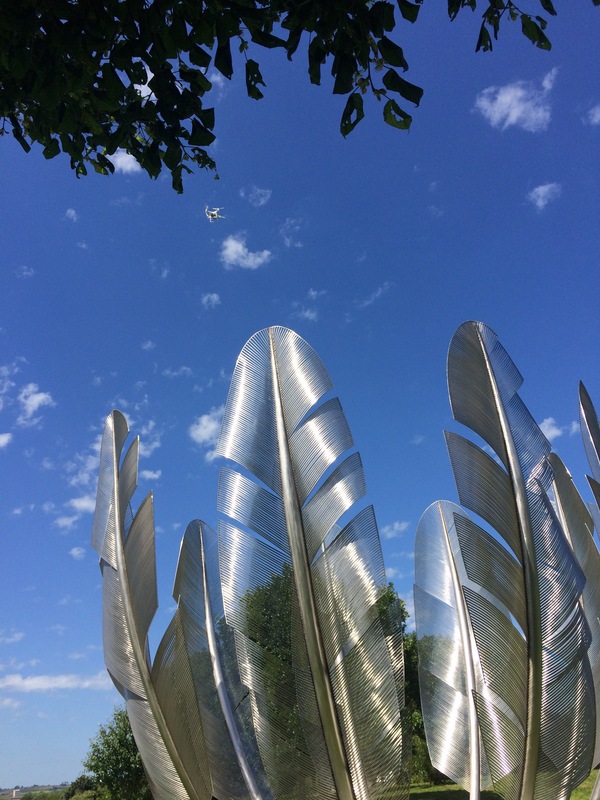 They began migrating on foot to Indian Territory, now a part of Oklahoma, along what became known as the ‘trail of tears’. With no help from the government and often without food and supplies and in dreadful weather conditions, many thousands died along the way. 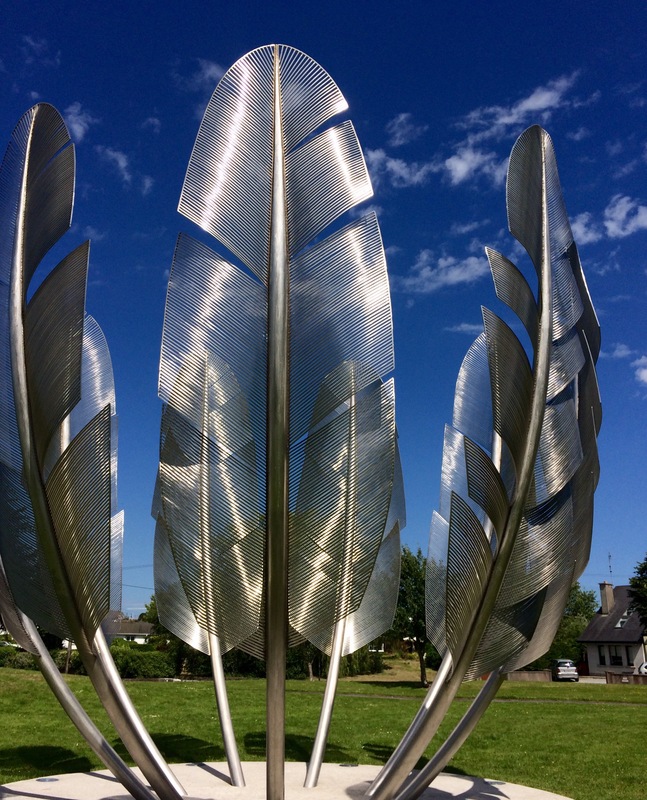 It is estimated that nearly one third of the Choctaw Nation perished due to starvation, exposure and disease on the 500 mile walk, the ‘trail of tears’. 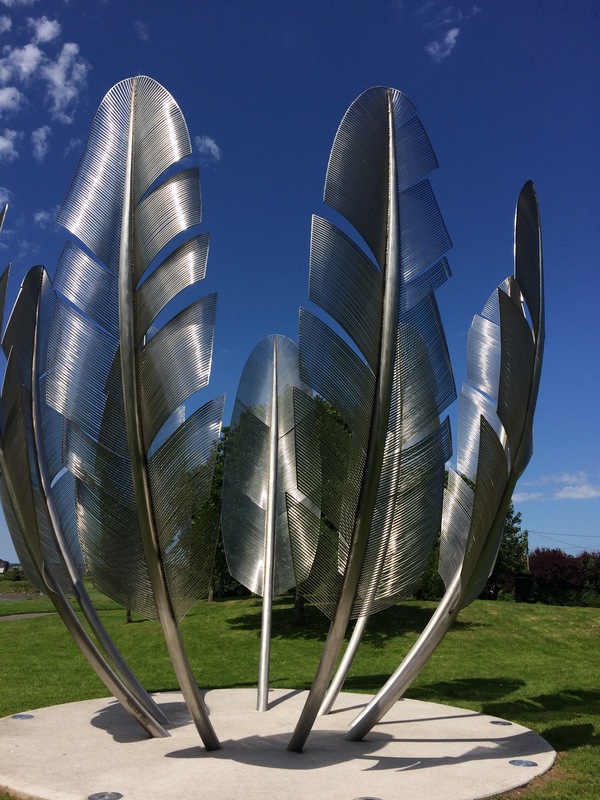 Several years later the Choctaw Nation, on hearing of the famine that had struck Ireland in 1845, made a donation of $170 to the Famine Relief Fund of Ireland. 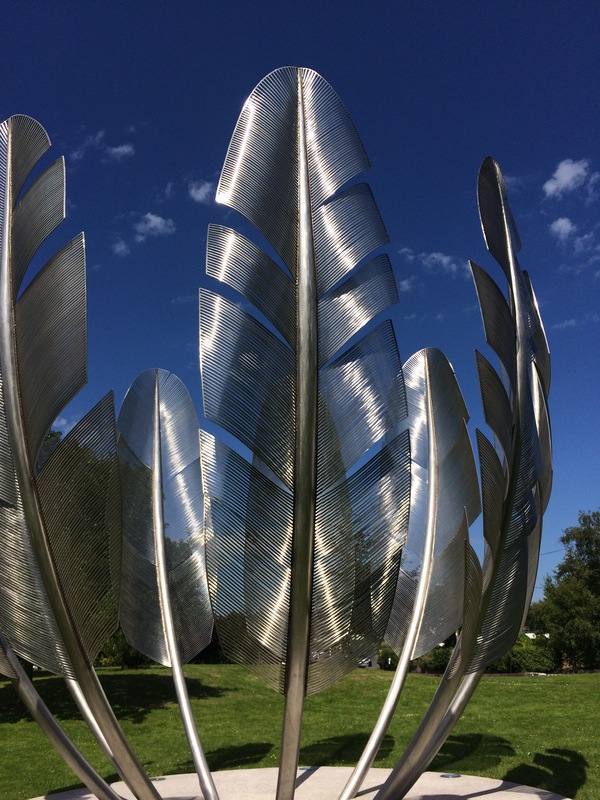 Whilst many donations were made for famine relief at that time, what makes the Choctaw donation stand out is that they were living in great hardship and poverty at that time. 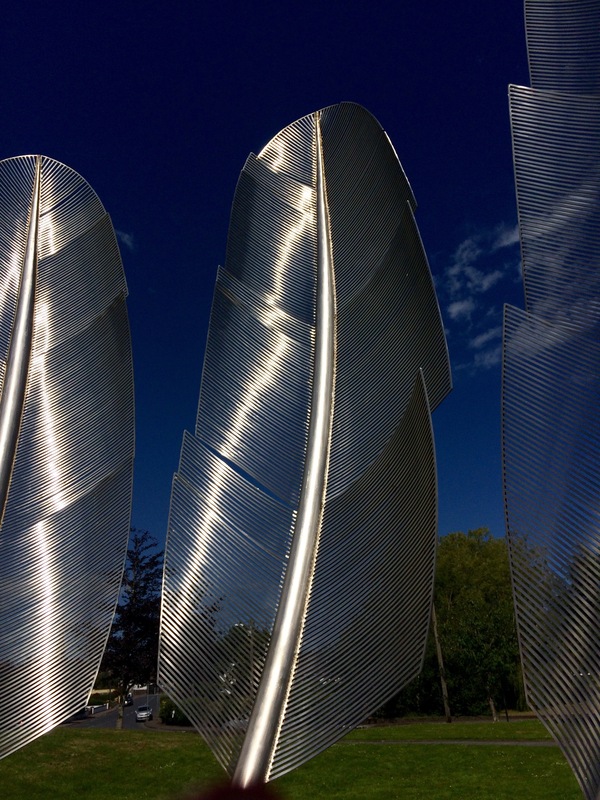 It is in recognition of that fantastic gesture that this sculpture, appropriately named ‘Kindred Spirits’ was created. 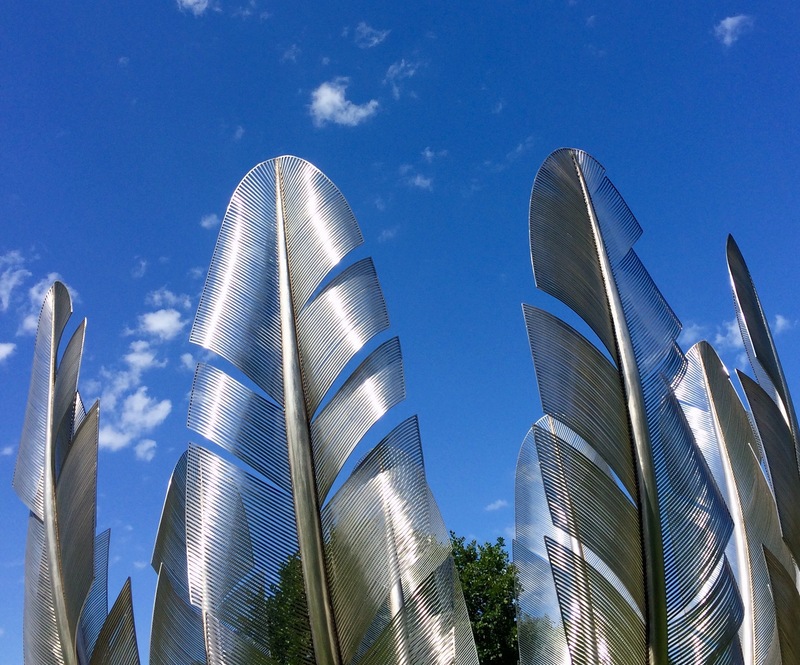 The sculpture consists of nine 20-foot (6.1 m) stainless steel eagle feathers arranged in a circle, to represent an empty bowl. No two feathers are the same. 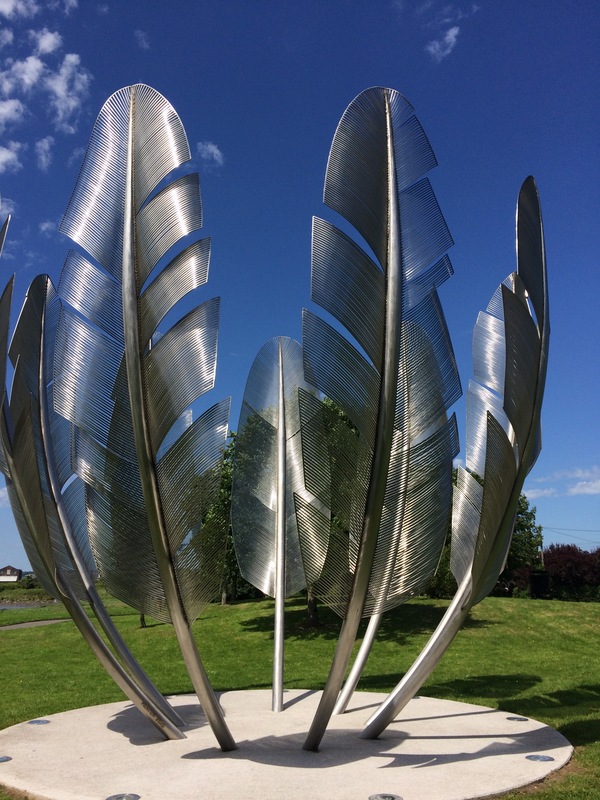 Although there is no direct connection between Midleton and the Choctaw donation of 1847, we are delighted to have such a wonderful piece of public art in our area. 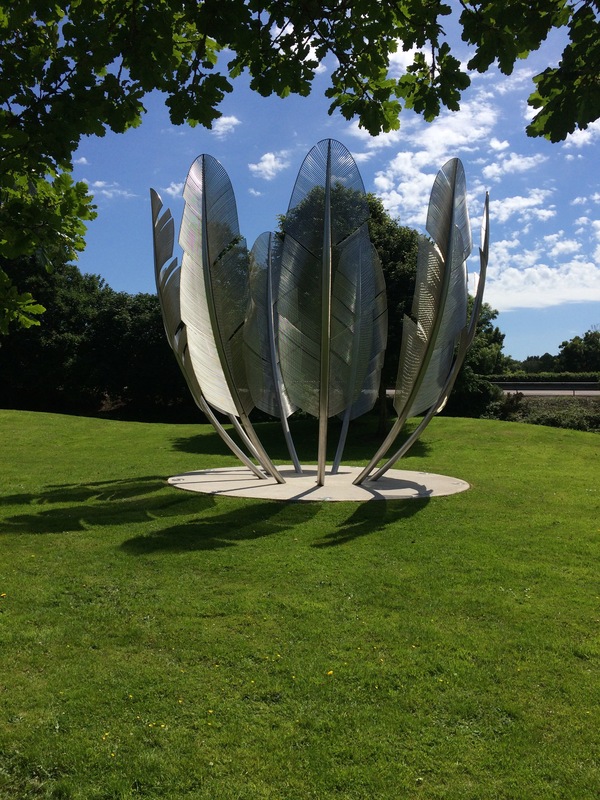 It can be seen from the Cork to Waterford N25 road, when travelling in the direction of Waterford. It has become something of a tourist attraction and has regular visitors – individuals, small groups and entire school classes. 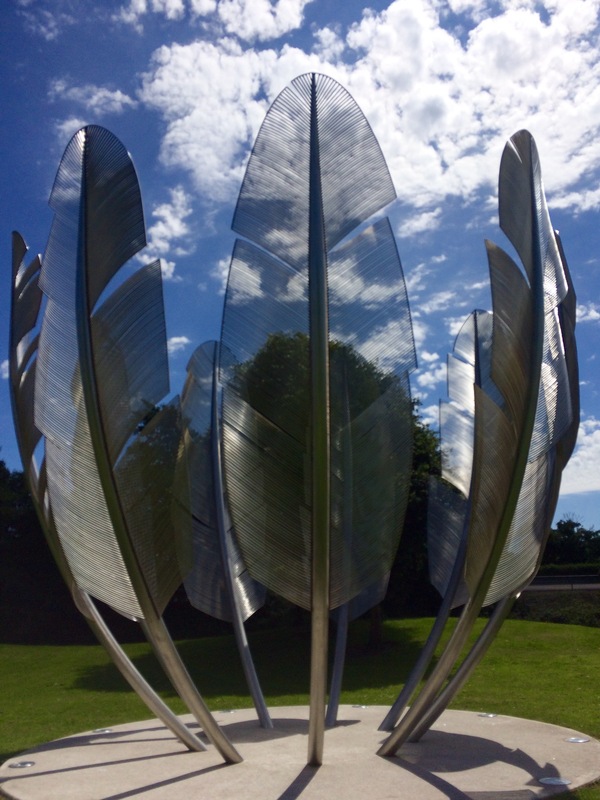 Probably one of Ireland’s most impressive public sculptures, it is a fitting tribute to the generosity of the Choctaw Nation who saw themselves as our kindred spirits in our time of need. I love it and hope you enjoy looking at it as much as I do! 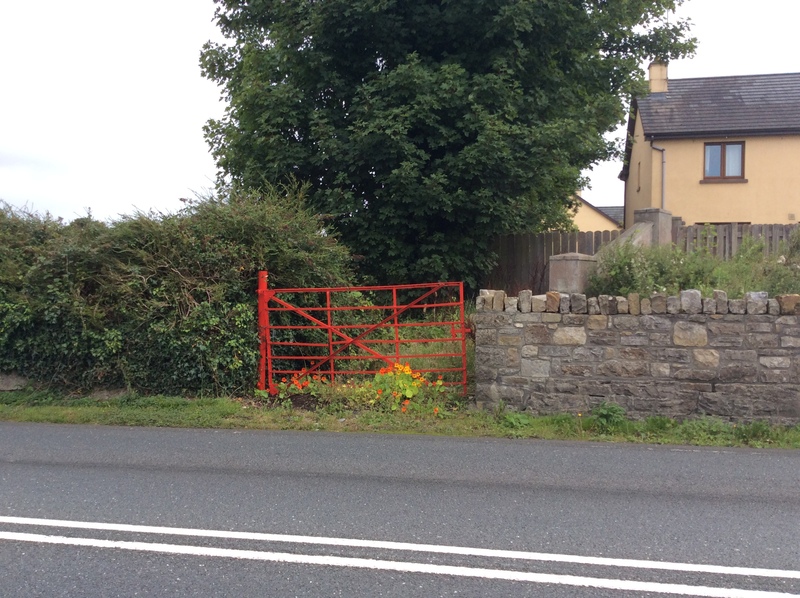 Newtonwforbes in County Longford is a small village located just a few miles outside Longford town, on the busy N4 Dublin to Sligo road. 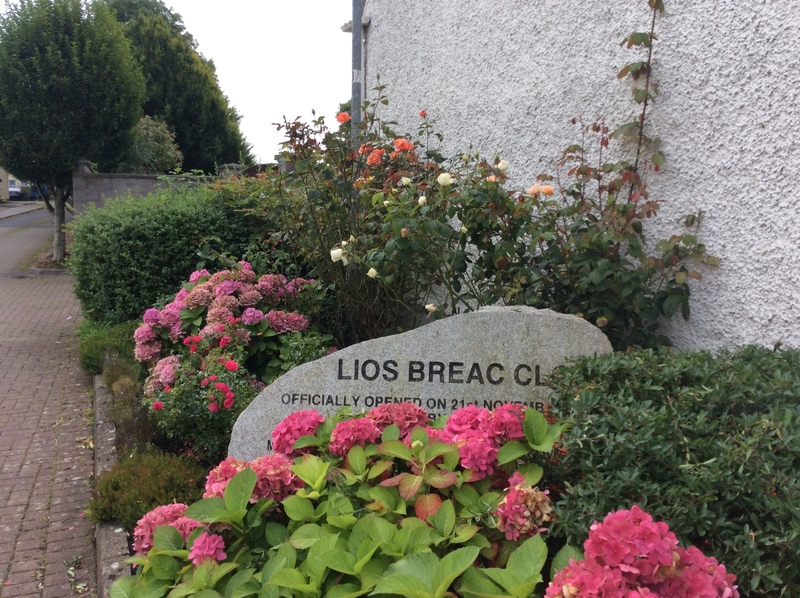 Originally known as Lisbrack (Lios Breac in Irish), the name was changed to Newtownforbes in the middle of the 18th Century by the Forbes family, who were granted the lands here in the early 1600s. 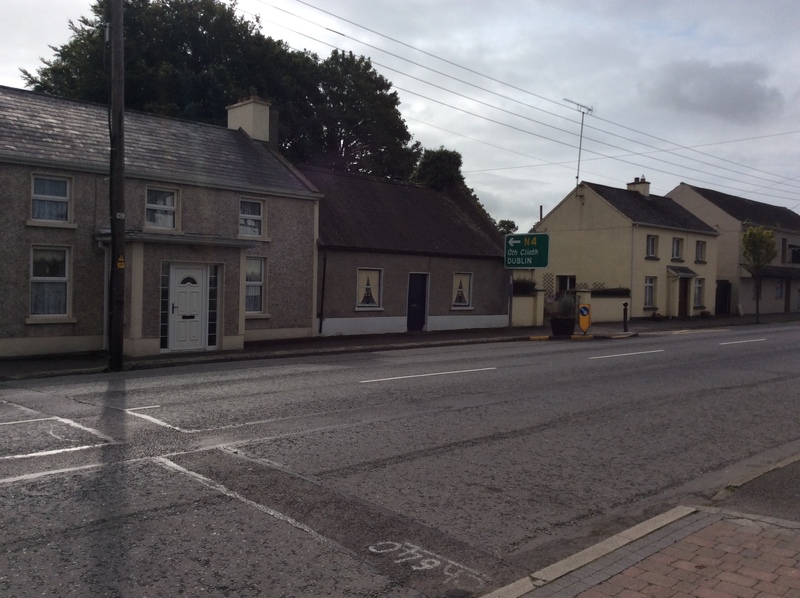 The Forbes family, with the title Earls of Granard, have lived in the village for over 300 years. The gates to Castle Forbes are in the middle of the village. The present Castle was constructed in the 19th Century – the original built c.1624 was destroyed by fire. As this is a family home, the entire demesne is private and not open to the public. In 1911, the grey squirrel was introduced here. An indigenous species of North America, several pairs were given as a wedding gift to a member of the Forbes family in 1911. A number escaped and went on to breed prolifically and almost annihilate the native Irish red squirrel. Fortunately the progress of the grey squirrel seems to have finally been halted in recent years, and the red squirrel is again increasing in numbers. 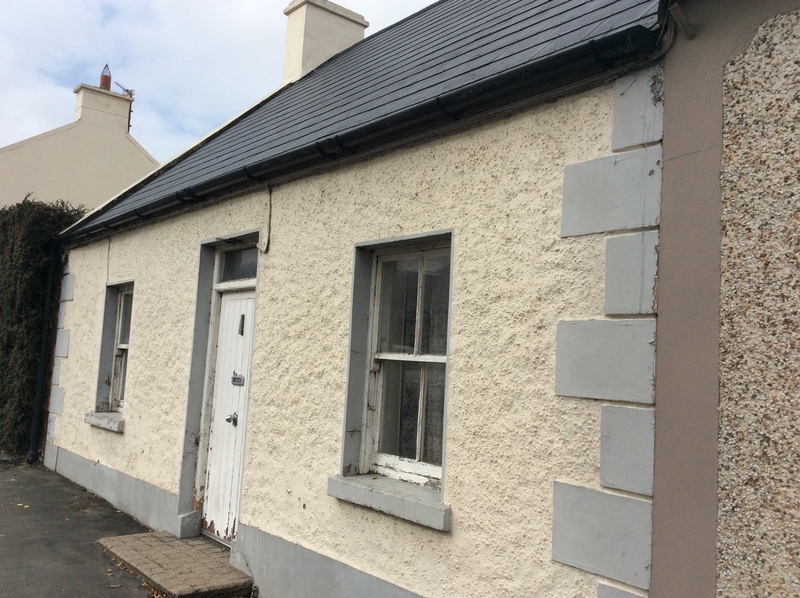 The main street in Newtownforbes has remained largely unchanged over the decades with modern development confined largely to side streets. 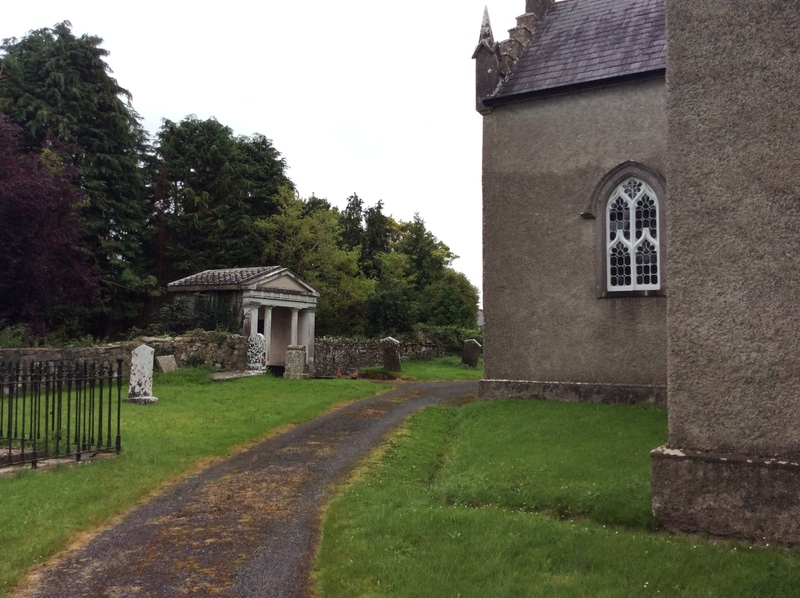 Two churches dominate the village, both provided by the Forbes family. 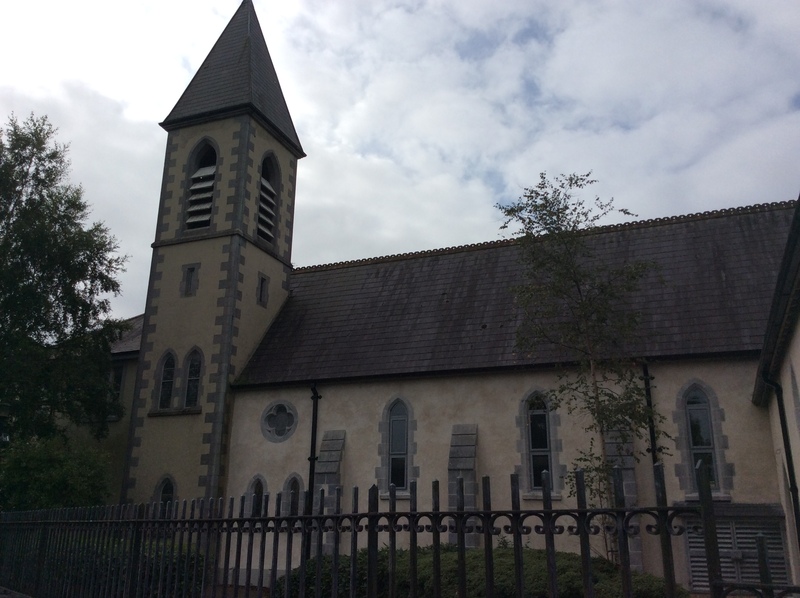 The Church of Ireland church of St. Paul, built about 1820, replaced an earlier church from 1694. 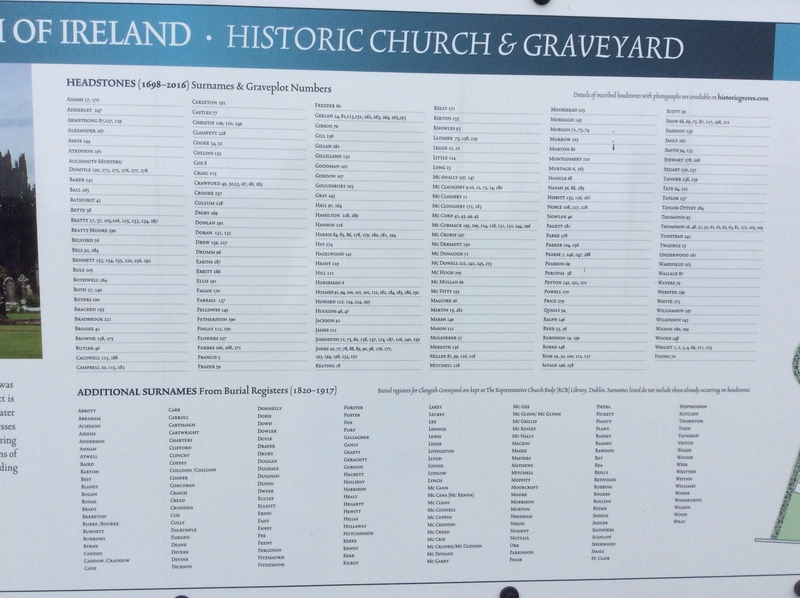 The graveyard here has been mapped and recorded by a local team of dedicated volunteers lead by Doreen McHugh and Des Mooney. The earliest recorded burial dates to 1698. The results of their work can be seen on the Historic Graves website. See the link below. There is a Forbes family crypt in this churchyard and interestingly, and unusually I would think, there is another Forbes family mausoleum attached to the Roman Catholic Church of St. Mary’s. Forbes family coat of arms. The Catholic Church of St Mary’s, where I was baptized, is in the centre of the village. 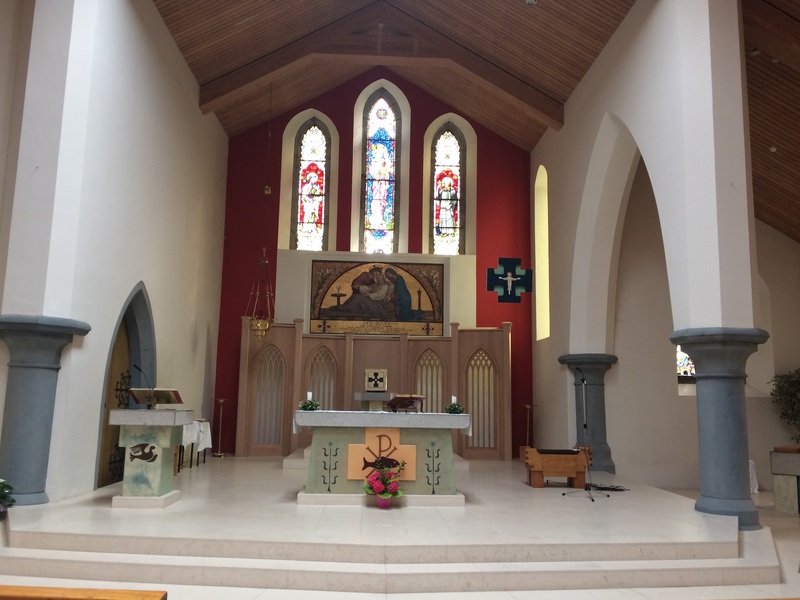 This is the parish church of Clonguish. It has been almost totally remodelled in recent times. The ‘explanation’ for this dramatic change appears on this plaque at the side of the church. It would appear that the term ‘restoration’ can have a very broad meaning! Plaque marking the 1974 work on the RC Church in Newtownforbes. 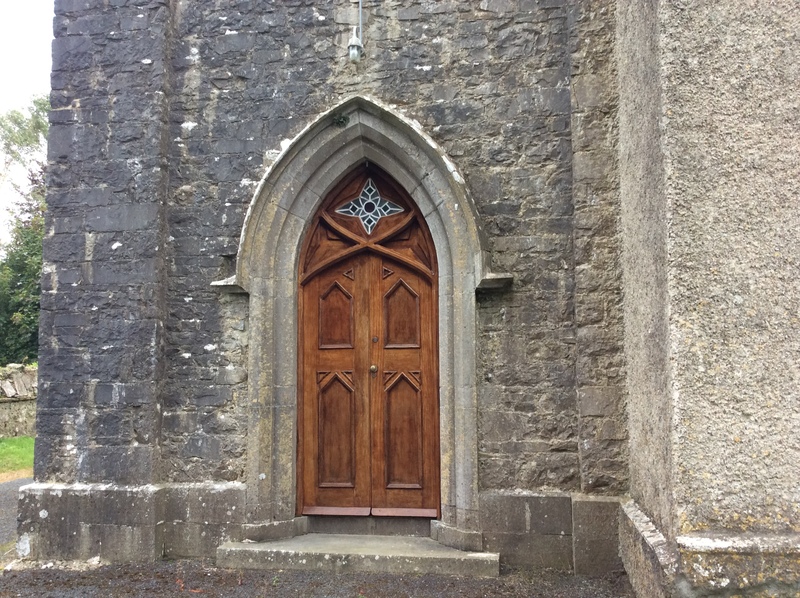 Either side of the main entrance door are two carved heads, which may or may not represent specific people. 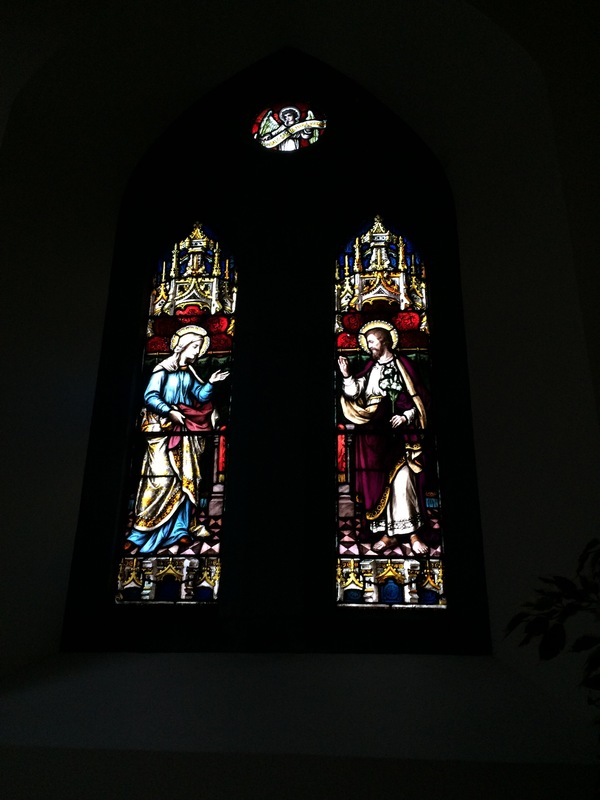 These are part of the original church, built 1861-1864. 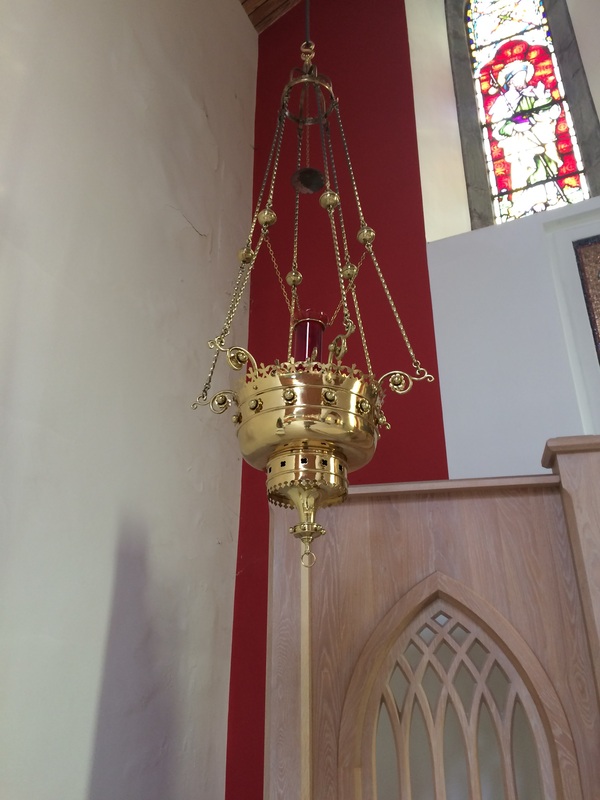 I had hoped that some of the interior survived the renewal, in particular the baptismal font at which I was christened, but I was to be disappointed. With the possible exception of the brass sanctuary lamp, some stained glass windows and the mosaic memorial to the local nobility, everything else seems to be modern. 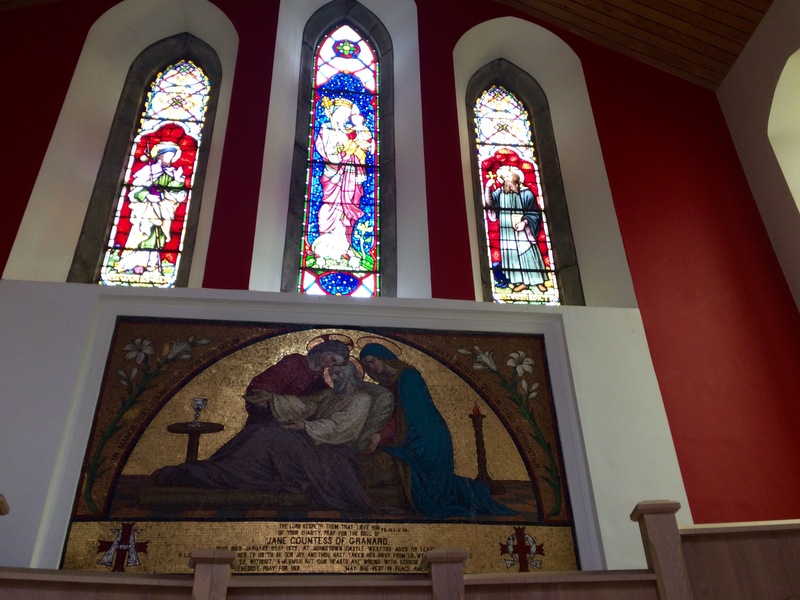 Lovely stained glass windows with mosaic memorial. 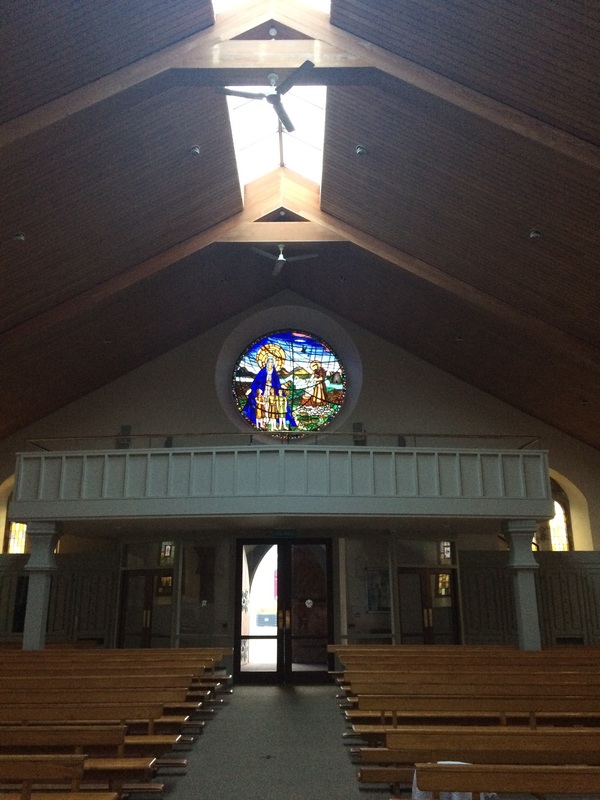 The new round stained glass window is very attractive and compliments the interior. The original side aisles have been removed and everything within seems to be very modern. 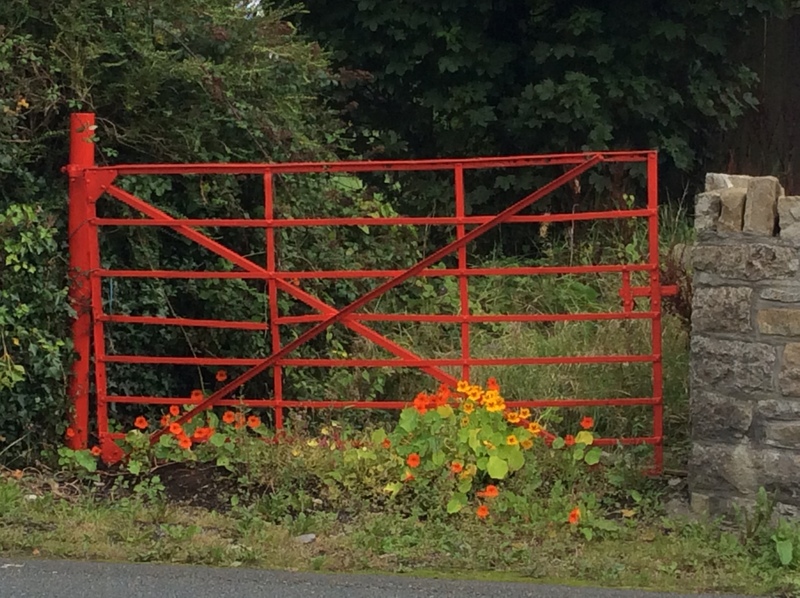 Returning to this little village in the midlands of Ireland is always poignant. The Station House, in which we were born and where we spent many happy times with our grandparents, was built in the 1860s and closed as a railway station in 1963 . It is now a beautifully maintained private residence. It is always nice to stand on the little bridge and look down to the place where we made many happy memories. The railway line is still in use. I have lovely memories of walking along the line with my grandfather. The main telephone lines ran on poles along the line in those days. and he used to lift me up and place my ear against the poles to hear them ‘singing’. The Dublin – Sligo line is still in use although the station is closed. It was always exciting to cross over this little bridge as we knew we had arrived for more adventures! Quite near the Station is the abandoned Lisbrack House. Most recently a nursing home, it was once a school and a bishop’s home. To the best of my recollection our mother was taught to play the piano in this building by a very cranky nun who was also a great pianist! 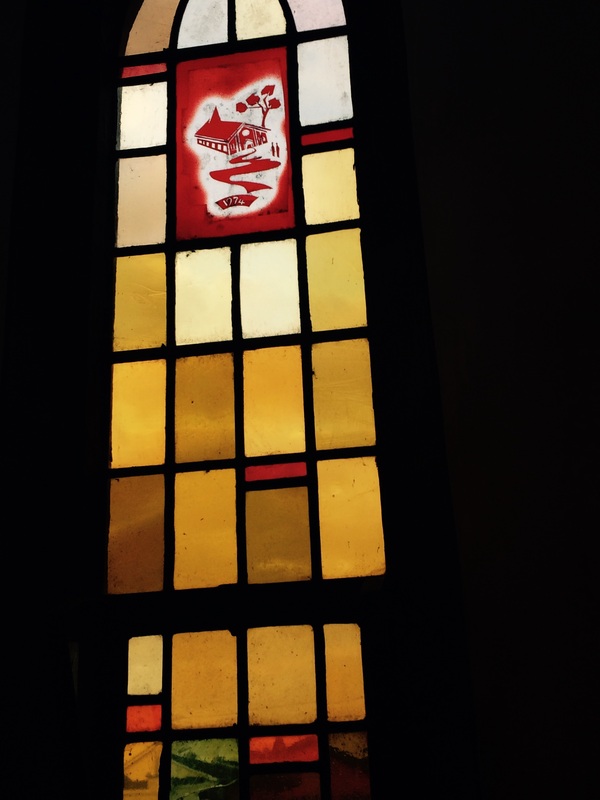 Another prominent religious site on the main street is the Convent of the Sisters of Mercy. 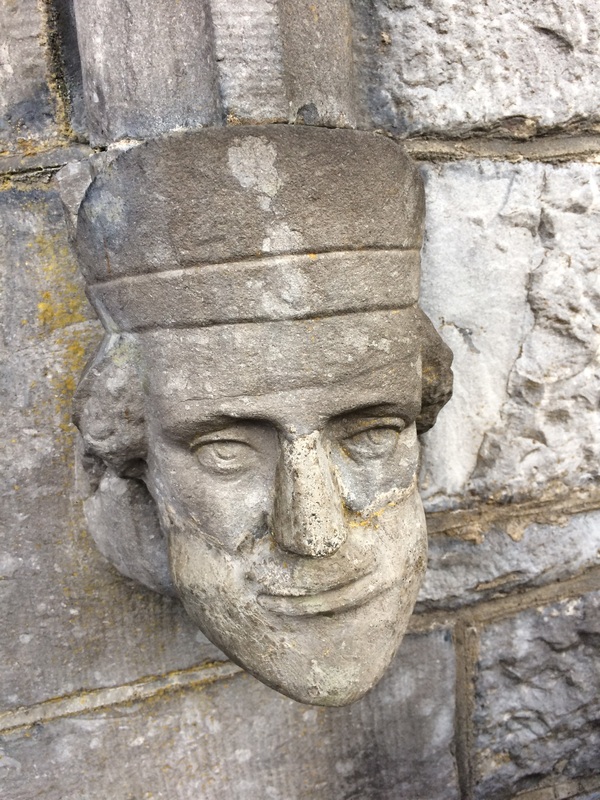 About 1869 the nuns were invited here by the Earl of Granard who provided the site for the buildings to enable them to educate the children of the estate. An orphanage and industrial school were also established here. Sadly this site had a role in the tragic legacy of such establishments in Ireland. The school and convent are now closed and I understand that these rather nice buildings are now apartments. The village has many buildings from the 19th and early 20th centuries. 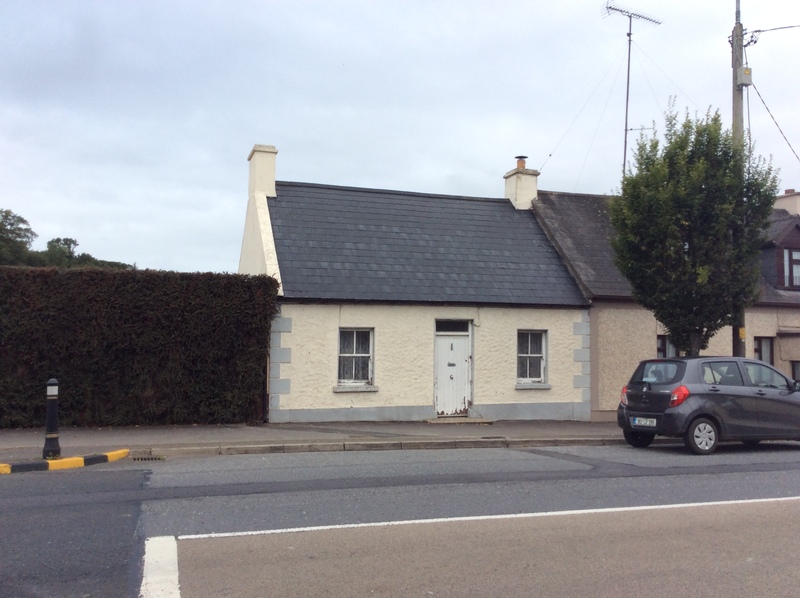 The two storey tudor style house is one of a pair provided for estate workers and it was in these that County Longford’s first flushing toilets were installed. A Tudor style house built for estate workers – among the first in the county to have flushing toilets! Many of the houses would would have originally been thatched and unfortunately many are no longer occupied. The former RIC Barracks built c. 1900 was burned during the War of Independence. 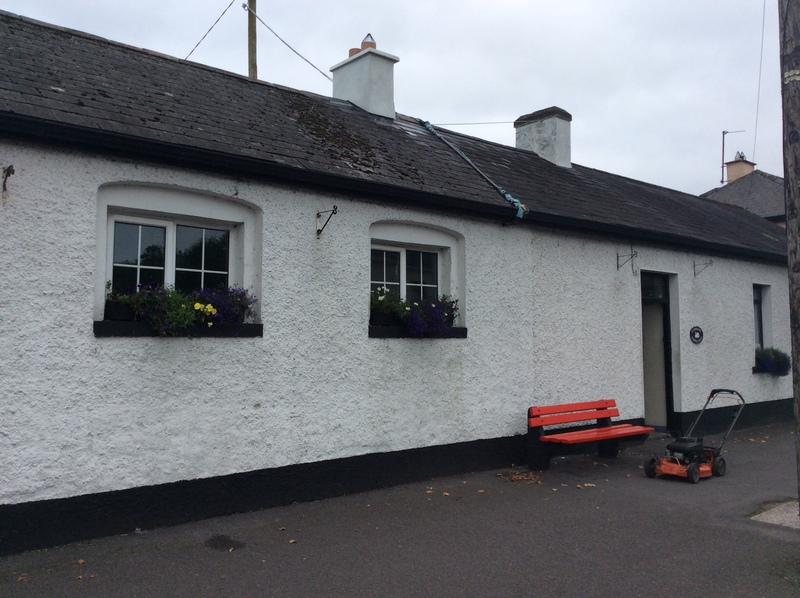 It was later rebuilt for the use of the Garda Siochana (Irish Police) and is now a private residence. 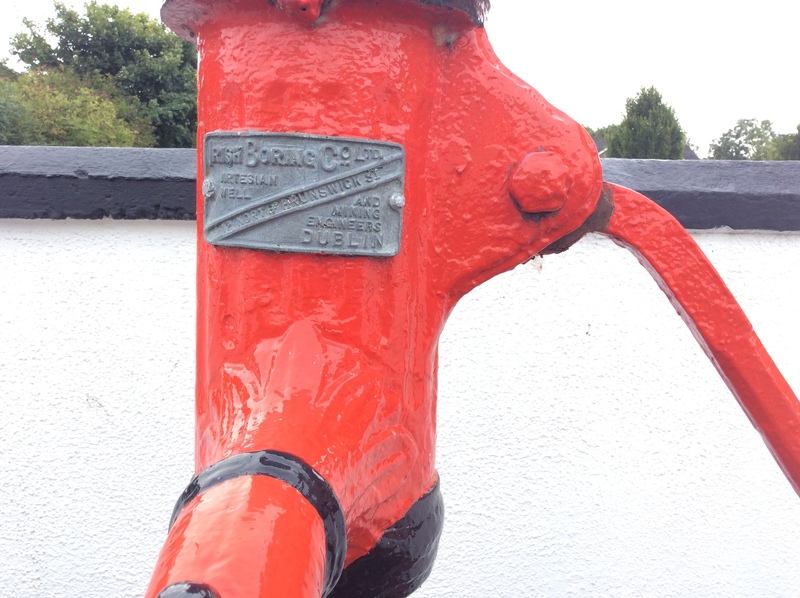 This interesting item is the Famine Pump. It was provided by Lord Granard as a Famine Relief scheme. 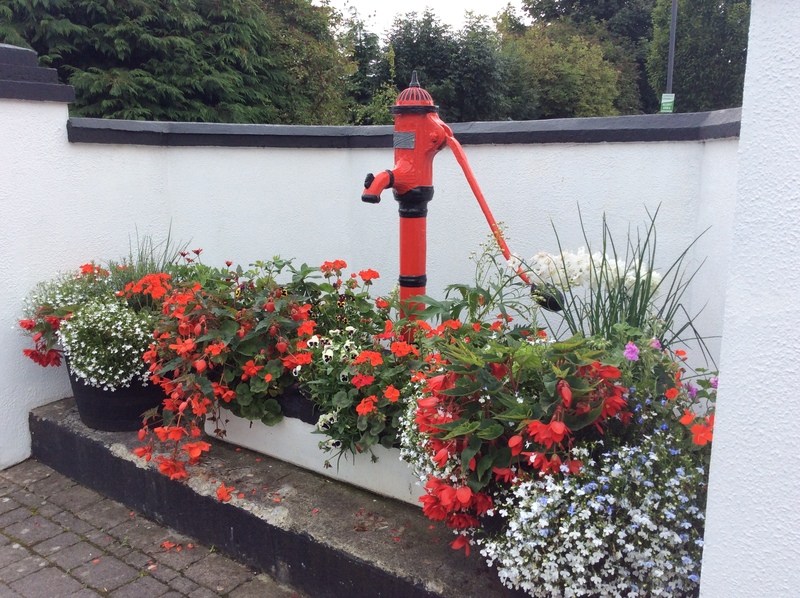 It sits alongside a building that started life as a shooting range in Longford army barracks. 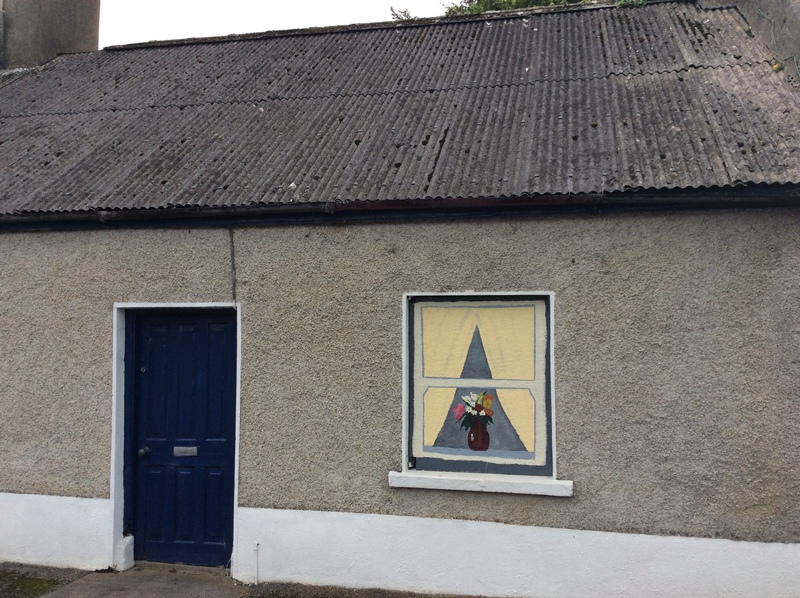 It was purchased by a local who erected here c.1933 and is known locally as Christy’s Hall. 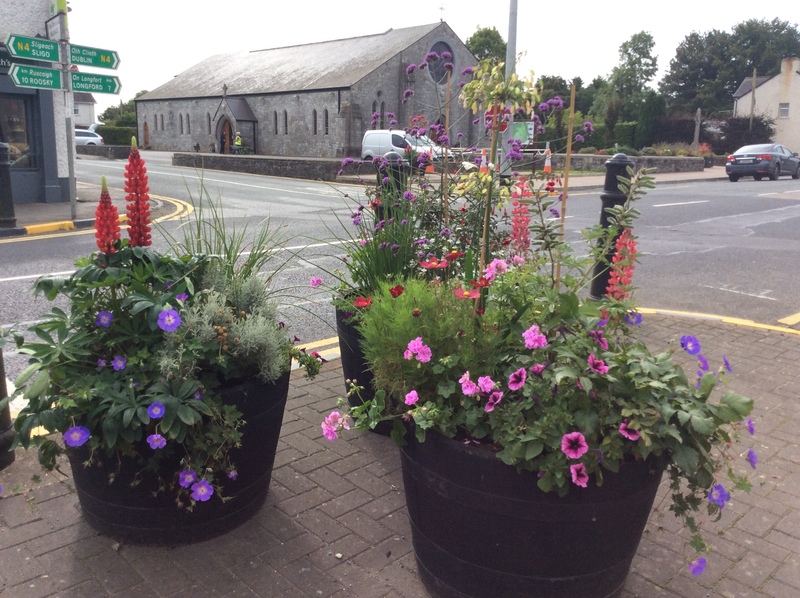 The hard work of the local tidy towns volunteers is evident throughout the village. And local junior artists have also been decorating the hoarding surrounding the former school buildings. 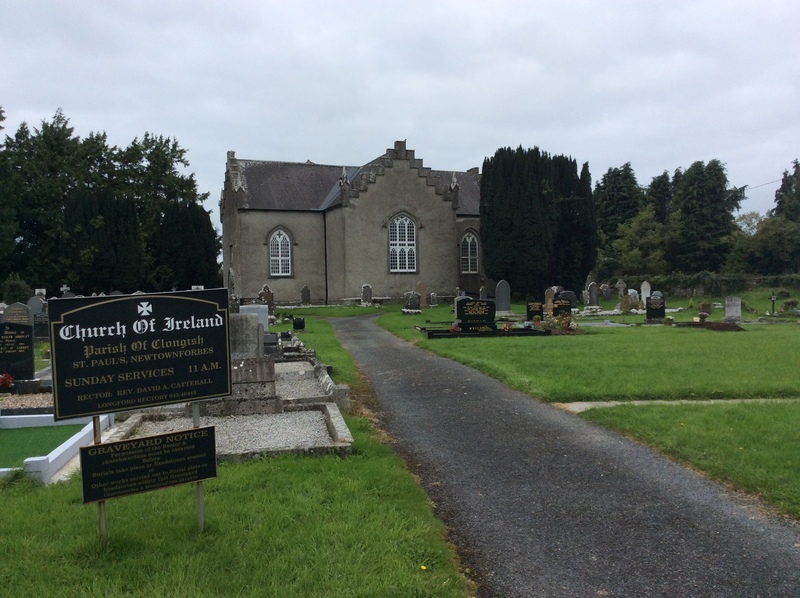 A board inside the church lists the townlands in the parish of Clonguish, which derives from the Irish ‘Cluain Geis’ which means The Meadow of the Swans. 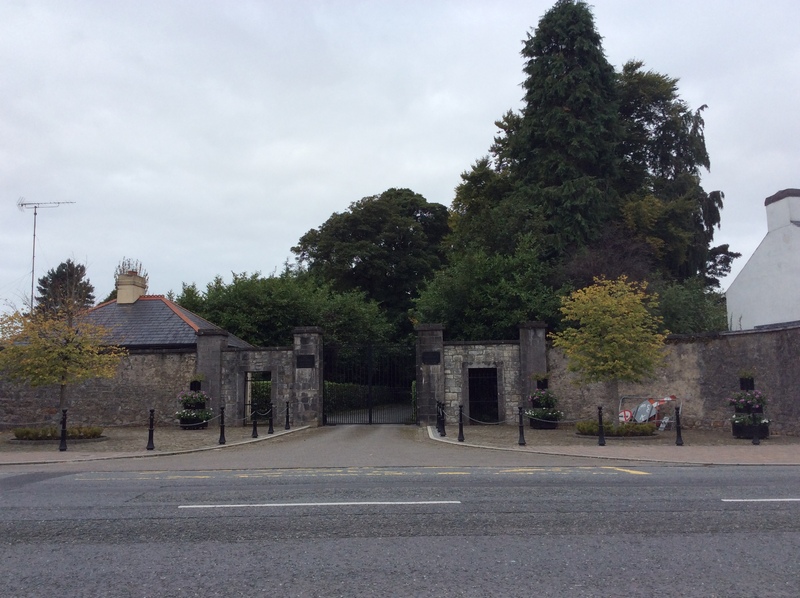 Newtownforbes is the last resting place of our grandparents and an uncle and aunt so visits nowadays are to pay respects at their graves in the new cemetery. One of the great delights of my brief visit discovering a great little restaurant called Tús Nua right on the main street, so if you happen to be passing through, drop in for a wee wander through this quaint little village and enjoy a fabulous coffee in this delightful coffee house! 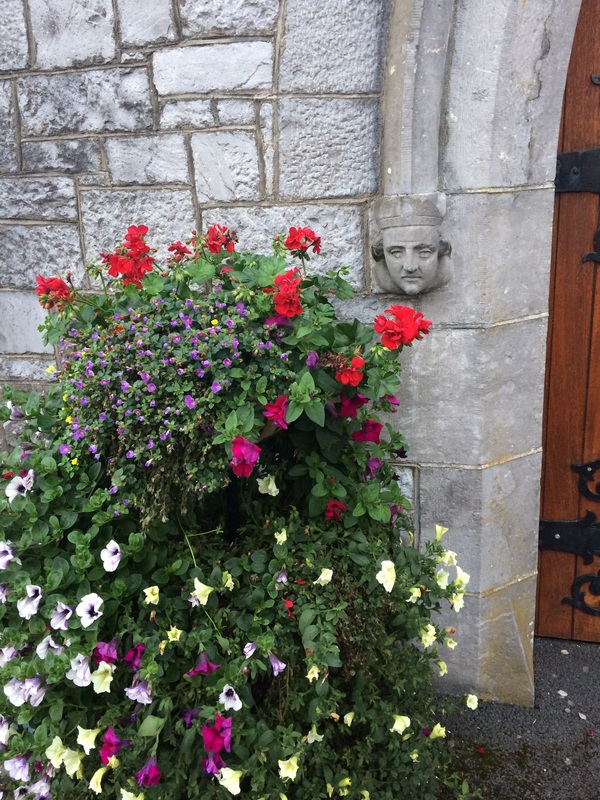 Yesterday I attended a conference at the Irish Workhouse Centre in Portumna,Co Galway. This was my first visit to this complex of buildings, which date from 1850. Workhouses were introduced in 19th Century Ireland to provide food and shelter for the destitute. The very name ‘Workhouse’ has terrible connotations to this day because of the awful conditions in which the inmates lived. Families were split up on arrival with separate wings for men, women, boys aged between 2 and 15 and girls aged between 2 and 15 . Children under the age of 2 could stay with their mother. Parents were permitted ‘ to have an interview with their child at some time in each day’, other than that, there was total segregation. How cruel for little children who would not understand what was going on. The rear the building that housed the boys. With piles of rocks in what was the yard . At the height of the Great Famine that raged from 1845 to 1851 or 1852, the poor were clamoring for admittance. Buildings built to accommodate 600 people could have been packed to overflowing with 1,600 people. The daily food allowance was minimal and of poor nutritional value, and many inmates of these establishments died of disease such as dysentery, cholera and typhus. How many weary women went up and down these stairs while this building was in use? Inmates had to work in exchange for food and shelter. Women took care of laundry, scrubbed floors, did the cooking and did sewing and mending while men did often meaningless heavy work such as breaking stones. The laundry area has some very fine industrial archaeology. By the end of the Great Famine Ireland had 163 Workhouses. Many of these eventually became local hospitals and still stand today as care centres for the elderly. Many have been demolished and have disappeared without trace. 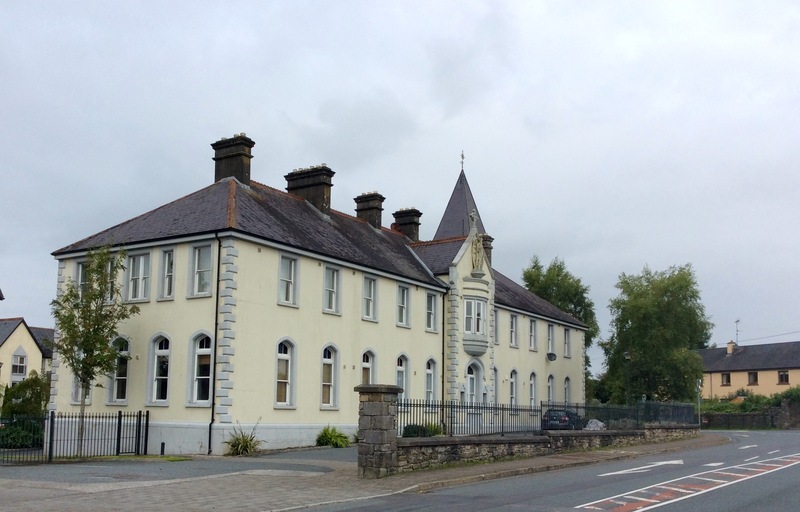 This wonderful project in Portumna which houses the Irish Workhouse Centre is a credit to those who had the foresight to save these buildings from total dereliction. Steady progress is being made with restoration and conservation work. The centre is in use for educational purposes and there are plans for a Workhouse Museum. The guided tours of the buildings are a revelation, and are conducted with knowledgeable enthusiasm. Only a handful of Workhouses remain in their original format. 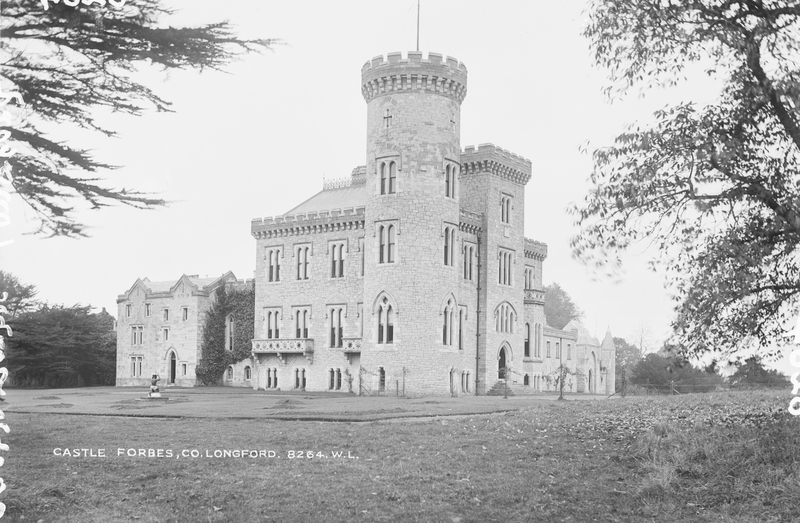 This unique complex of buildings in Portumna stands testament to the history of the ordinary people of Ireland, the non landed gentry from whom most of us descend. Ordinary people who endured extraordinary hardship – many of them died, many emigrated, many survived too. This is a tangible monument to them all and deserves our support.